We’d love your help. 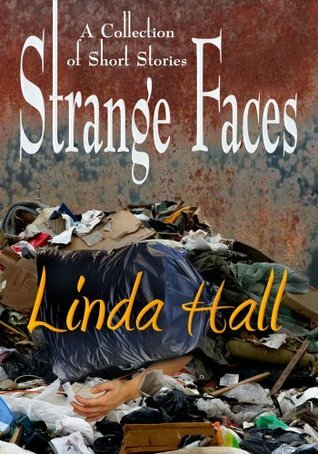 Let us know what’s wrong with this preview of Strange Faces by Linda Hall. From experienced and award winning author Linda Hall comes Strange Faces, a collection of seven stories that will take you to a place where killers can linger in your backyard but where magic can sometimes change everything. The voyage begins with Pickers and Choosers, and with a group of young dumpster foragers who witness a murder. Or do they? And why now, after twenty-s From experienced and award winning author Linda Hall comes Strange Faces, a collection of seven stories that will take you to a place where killers can linger in your backyard but where magic can sometimes change everything. The voyage begins with Pickers and Choosers, and with a group of young dumpster foragers who witness a murder. Or do they? And why now, after twenty-seven years is the terrible memory resurfacing? In A Nice Cup of Something Hot we meet Mrs. Wilkers, a divorced woman obsessed with her ex-husband, his new wife, and ultimately with death and murder. The connection between siblings plays a key role in two of the stories. We Are Brothers is about very different twins. Weather Ladies attempts to answer the question, what do you do when you find out your sister is a murderer? Mad Scientist is all about revenge. How far can someone be provoked? Far enough to murder? On the lighter side, The Hockey Bag features a young man, who through no fault of his own, gets caught up in a rather gruesome bag of tricks. You will smile, or tear up, with A Small Season of Magic. It’s a story of a girl, of bullying, and what happens when a small bit of magic intervenes. To ask other readers questions about Strange Faces, please sign up. “I’ve suspected for some time that I should go to the authorities about Lewis. Why haven’t I? Most of these tales are dark. Through her characters Hall plumbs the depths of the human heart’s capacity for jealousy, fear, desire for revenge, rage at being deserted. Several stories also speak about bullying. She asks ‘What if…?’ and then sees the matter through to its deadly conclusion. And so there’s murder and mayhem, but ever so genteelly disclosed. In these stories we meet young and old, damaged and whole, down-and-out and starting over. Linda Hall never shies away from social issues in her mysteries, and readers will met lonely souls, caregivers, victims of bullying and of dementia. Many stories deal with family ties and loyalty. As well as strongly-evoked characters, the author gives us vivid descriptions. Each story contains a depth and richness, as if we're joining fully-developed individuals in a slice of their lives. Back story is always introduced in an organic way in just the right amount to let readers discover what we need to know. This is a very enjoyable read - a definite "must" for your summer reading book list! Linda Hall is a strong writer with memorable characters and riveting plots. I loved these stories. Very compelling and eerie and Ms. Hall's endings are far from what you might expect them to be. Kudos! I loved this collection of short stories. Very deft writing and some seriously creepy plots. Two thumbs up. I write mystery novels and short stories. So far I have 20 in print - with more coming. My newest mystery series begins with Night Watch and introduces my new series character, boat captain Em Ridge. Other series include the Corporal Roger Sheppard mysteries, The Teri Blake-Addison PI thrillers and the Fog Point mysteries, as well as a number of romantic suspense novels and short stories. For infor I write mystery novels and short stories. So far I have 20 in print - with more coming. My newest mystery series begins with Night Watch and introduces my new series character, boat captain Em Ridge. I grew up near the coast in New Jersey, and it was there that my love of the ocean was nurtured. I married a Canadian and have lived in Canada ever since - well, actually, I have lived in three countries: the U.S., Canada and for a short stint - Taiwan.